Back in 2006, SolarCity was a small Bay Area solar energy startup with a handful of employees. Before long, according to CEO Lyndon Rive, the company was doubling in size every year to keep up with voracious demand for rooftop solar systems. Today, the company has over 9,000 employees spread across 65 offices nationwide; they’re are busy every day designing, selling, and installing solar systems. Similar stories are playing out at solar companies across the country. The U.S. solar boom is taking off at breathtaking speed – even though solar is still a tiny slice of the American energy pie, it has by far the fastest growth of any energy source, and it’s adding jobs apace. As of November 2014, the U.S. solar industry employed 173,807 people, up 21.8 percent from a year before, according to a new survey by the Solar Foundation, a nonprofit research outfit. That’s 10 times faster than job growth in the overall U.S. economy, which was just 2 percent over the same time period, according to the Bureau of Labor Statistics. 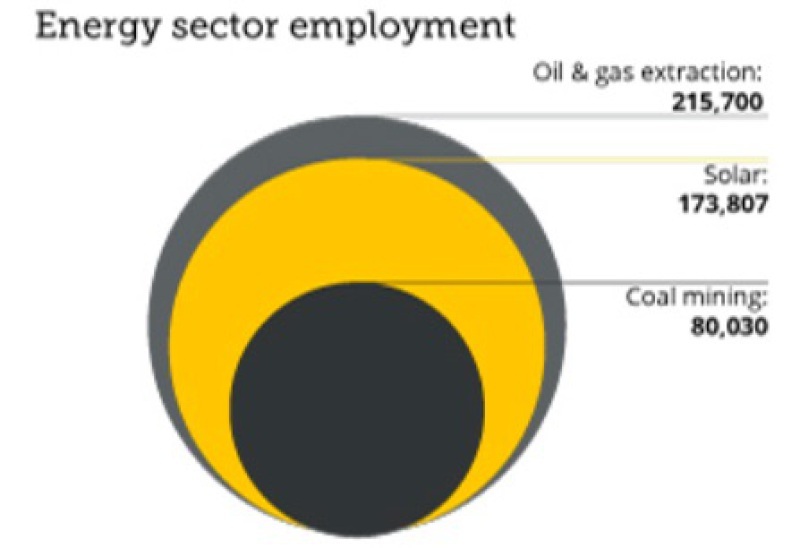 Solar employment is also outpacing job growth in the fossil fuel industry. 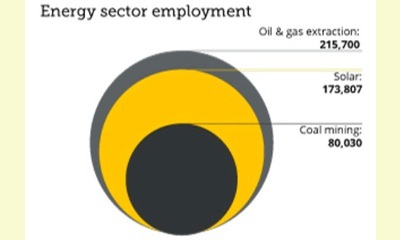 Solar jobs now outnumber coal mining jobs 2-to-1 and are quickly catching up to jobs in oil and gas extraction, as well. What’s behind that growth? Aside from the fact that the solar sector is growing rapidly, solar is an industry that simply requires a lot of boots on the ground. A 2012 University of Tennessee study found that solar employs more people per megawatt-hour of electricity than any other energy source. That’s largely because of the labor needed to install new rooftop systems every day, SolarCity’s Rive said. Installers make up more than half of the jobs counted in today’s survey (other categories include sales and manufacturing). Don’t expect this kind of growth to last forever, Rive said. Installation is becoming more efficient, and the industry is expecting a slowdown in growth in 2017 when a major federal tax credit is set to expire. The survey reported that of the 2,000 solar-related businesses surveyed, 73 percent said that tax credit “significantly improved” business. U.S. manufacturing is also continually at risk from cheap imported panels from China, although part of President Barack Obama’s recent climate deal with that country is aimed at resolving clean energy trade disputes. (Thank you to Janet Hudgins, the CPNN reporter for this article). This report was posted on January 23, 2015.